with 30 day money back guarantee and a full 1 year manufacturer's warranty. 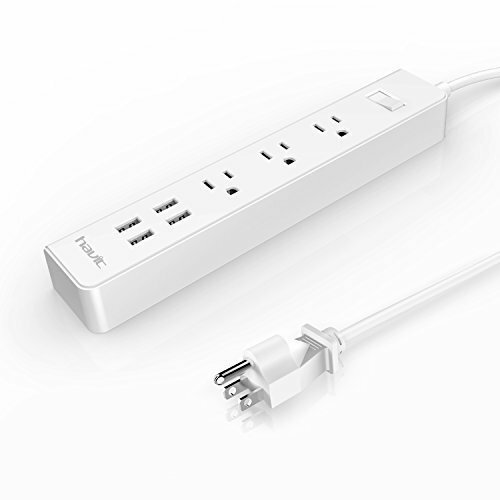 ★ 4-Port USB Power Strip - Fast and efficient charging for up to 4 digital devices simultaneously. The USB ports that can intelligently detects your device to deliver the fastest possible charge speed up to 2.4 A, which suitable for your ipad, iphone or other smart devices. ★ Safety Guaranteed - The power stripe was certified by FCC and RoHS and built-in adopting anti-fire ABS+PC materials, the quality and performance are fully guaranteed.Independent power switch and sophisticated circuit breaker design with Over-heated, over-voltage, over-current, short-circuit protection. ★ Space-Saving Design - HAVIT power strips have slender, modern designs that coordinate well in a home office, entertainment center, or any room with multiple electronic devices. ★ Considerate Design - HAVIT USB power strip features ON and OFF power switch, visible but not-too-bright LED light, good spaced power plugs to handle block power adapters, 5ft cord allows all your electronic devices plugged without restrictions.